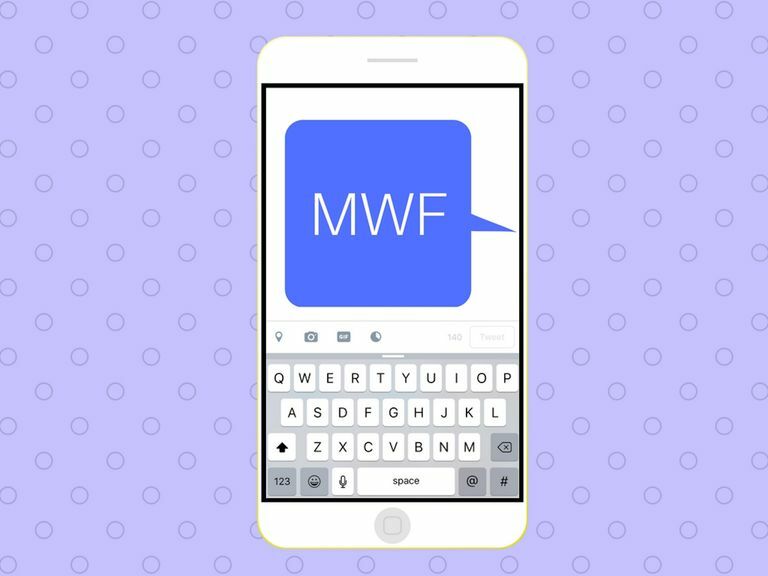 MWF is one of those strange yet rare online acronyms that can pop up unexpectedly. If you happen to come across it anywhere online or in a text message, it certainly helps to know how to interpret it. ​The two interpretations have completely different meanings, so you'll have to do a bit of extra work to figure out which interpretation is being used in a particular post or message. Luckily for you, it shouldn't be very difficult at all. The acronym MWF as Married White Female is often used in personal ads online, on message boards and in chat rooms to inform others of an individual's marital status, ethnicity and gender. Someone might describe themselves as a MWF with the intent of meeting someone who is looking to connect specifically with a married white female for friendship or romantic reasons. "MWF here, just moved to the city and looking for new friends. Would love to connect with other MWF or SWF." "M4W looking to just have some fun. Open to both SWF and MWF." "MWM seeking MWF for a discrete romantic relationship. Email if interested." People who use MWF as Monday Wednesday Friday typically do so to inform others of a particular weekly schedule. Students who have classes on these particular days are widely known to use the acronym this way, but it can also apply to people who have jobs and go to work on these days or organizations that plan to hold events on those days. MWF as Monday Wednesday Friday may also be accompanied by the acronym TH. In this type of scenario, TH usually stands for Tuesday Thursday, and is used to inform others of a Tuesday and Thursday schedule. "My MWF classes are all so early! At least glad I don't have to be in til 11am TH so I can sleep..."
"I'll be uploading YouTube videos MWF on my daily vlog channel." "We've got spin classes 8:00am MWF and 9:00am TH so come and down and get your sweat on!" Where are you seeing MWF being used? If you're looking on Craigslist or chatting with a complete stranger, they're more likely to tell you about their marital status/ethnicity/gender than their weekly schedule. If, however, you're seeing it used just in a general post on social media or by a friend via text, they may be trying to tell you about what they're up to Monday, Wednesday and Friday. Does it sound like the poster is looking for friendship or romance? If so, they very likely mean to use MWF as married white female. Does the poster reference a specific time and/or event? If the poster is trying to tell you or others exactly when something like a class or event is scheduled to take place, they're most likely using MWF as Monday, Wednesday, Friday. Does the poster include other acronyms? Other acronyms included in the post or message like the ones mentioned above can give huge hints. For example, if you see M4W included, the poster is almost certainly using MWF as married white female. Or if they use TH, they're definitely talking about their Monday, Wednesday, Friday schedule. Does one interpretation just sound like it makes more sense than the other? Try reading the message out loud to yourself, first by replacing MWF with married white female and then again with Monday, Wednesday Friday. If one just seems to fit better than the other, go with it.